This unique vintage ring was a gift given from a grandfather to a grandson. They picked out this unique treasure in an antique store while spending the day together during an emotionally challenging time for the grandson. After that, the grandson cherished it and wore it every day, and as a result, it was showing some serious signs of its age and appreciation. Although it was not originally a monetarily valuable or expensive ring, it had an important background and sentiment to its new owner. Our client wanted to be able to continue to wear this symbol of love and support from his grandfather every day, but in it’s current condition it was uncomfortable and noticeably worn down. 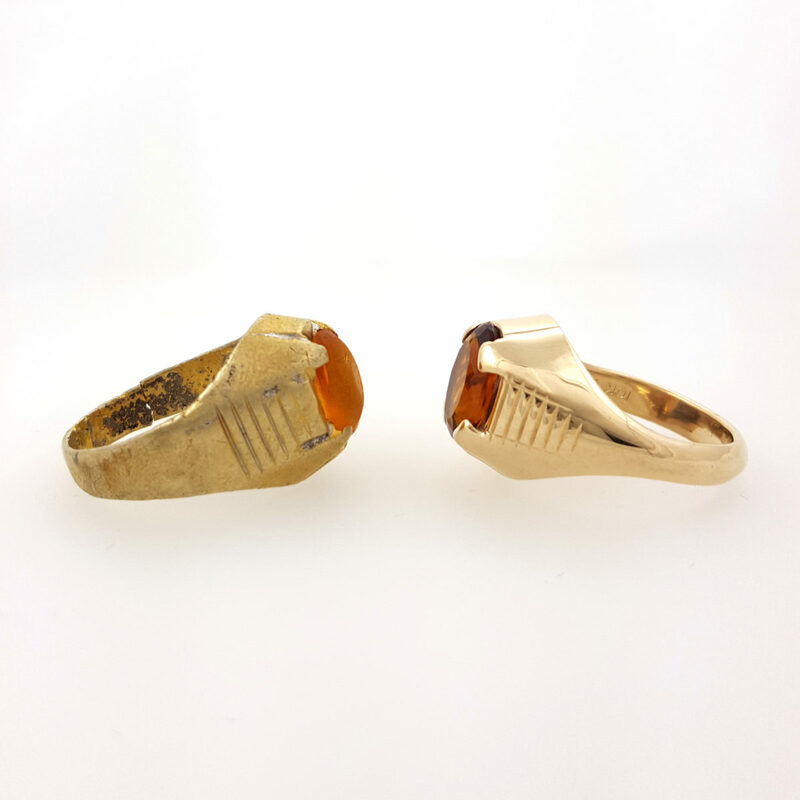 One solution was to have us re-create his heirloom ring using precious metals and a fine gemstone, so he could continue to enjoy it for years to come. 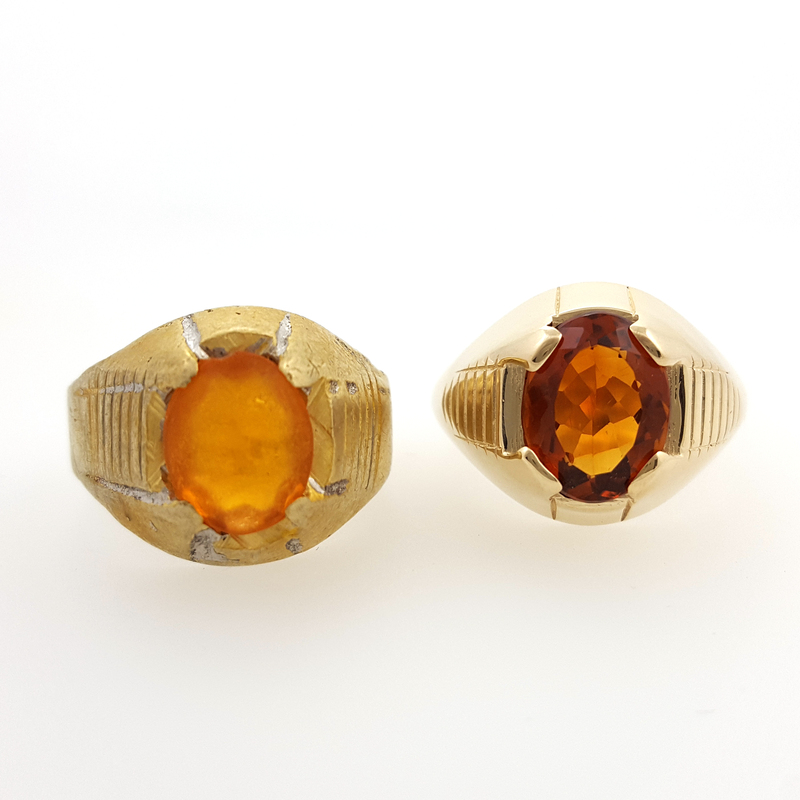 The first step was to find a gemstone whose color would match the color of the original synthetic stone in this vintage ring. We also wanted to use a stone that would be easy maintenance and would be able to withstand everyday wear. We chose a beautiful oval, orange citrine that fit all of those properties. We then designed a 10k yellow gold signet style ring based off of the original, in a slightly heavier setting and slimmed down shank in order to make it look better matched to its new increased value. The new ring now had a monetary value and the sentimental value more in line with each other. We understand that every piece of jewelry is more than just metal and stones. Each and every creation has a story, a meaning and emotions attached to it, so every element from the design to the materials is important. We are honored every time we are chosen to help with the creation of one of your cherished heirlooms.